Oak and beech smoked, dry cured pancetta rashers. Our Tesco Finest* dry cure bacon comes from outdoor bred pigs which give tasty, succulent pork. It was developed for us by experts who first began dry curing pork in Waberthwaite, Cumbria back in 1828. Nearly 200 years later, it’s still cured by hand following the same method to bring out the rich flavour before air drying for a meaty texture. Pork, Salt, Sugar, Preservatives (Sodium Nitrite, Sodium Nitrate), Antioxidant (Sodium Ascorbate). 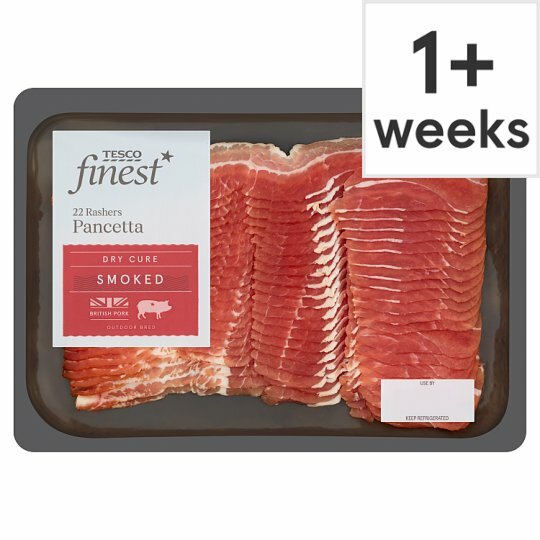 Prepared from 105g of Pork per 100g of Pancetta. Instructions: Place under a pre-heated grill for 4-6 minutes. Turn occasionally. For extra crispy bacon, grill for an additional 2 minutes. Instructions: For best results, pan fry. Fry in a little oil for 3-5 minutes, turning occasionally. Drain well before serving. Defrost thoroughly for a minimum of 6-8 hours in the fridge. Once defrosted use on the same day and do not refreeze.